Escaped Madrid by bus, which in Spain is like catching a plane, there are fancy tickets and special headsets and an onboard loo and everything, which is just as well as the ride was about 5 hours. 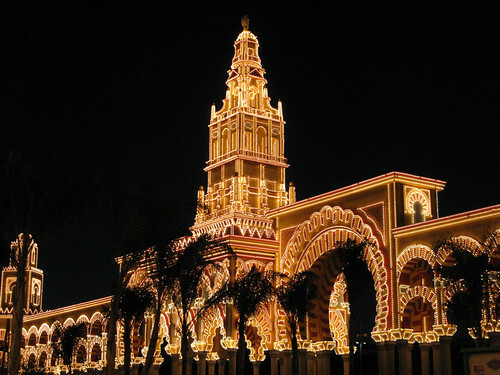 We arrived in Córdoba on the first day of their town festival, which was incredibly lucky for us. We spent the afternoon strolling the narrow little streets and looking at old churches and the Cathederal-Mosque-Cathederal, which was really lovely. Then in the evening (Spanish afternoon goes from 5pm till 8pm) went to the town fair. There are rows and rows of marquees that house dance floors and tapas bars. The one we happened to settle in had the matriachs of their families dancing Flamenco in outgagiously colourful dresses, to what Im going to dub ‘Disco falmenco’. Was loud and crazy. We stopped for churros (Spanish doughnuts) which are my new favorite desert. Then fell into bed at about midnight which I understand is early even for school kids here. We then trained to Seville. Wandered around getting a sense of the city. Then at night we caught a flamenco show which was stunning. Live gutarist and singer with a pair of very attractive Flamenco dancers swirling around and stamping their heels like crazy. It was fantastically moody one of the dances called for the female dancer to end the dance by stomping her feet and walking off the stage in a huff. Fantastic. The group Im with is really diverse. theres an Retired couple from Adelade, a couple from New Zealand, a doctor from Brisbane, a teacher and an accountant from Sydney and accountant from the UK and a Nurse from Seattle. Im the youngest by a little bit. 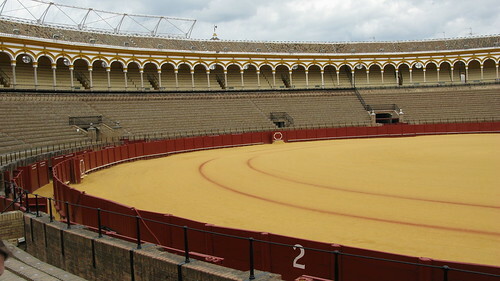 Today I plan to visit a bullring, a few palaces and eat gelato. This entry was posted on Wednesday, May 28th, 2008 at 9:40 am	and is filed under Travels.